Once you see this cosmetic issue, you cannot ignore it. You might be more self-conscious while taking pictures or try hiding it with scarves or other accessories. A double chin can immensely affect your self-esteem. While it sounds ideal just to have the extra fat surgically removed, it doesn’t address the root problem. 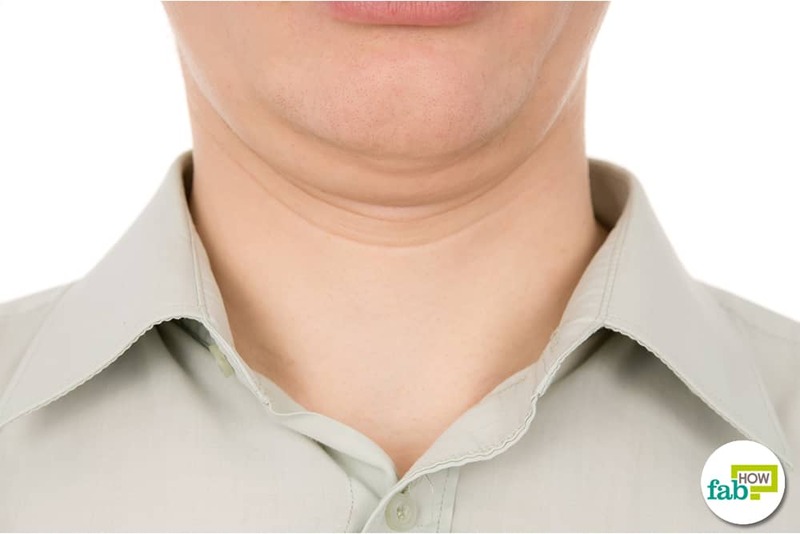 Most of the time, a double chin is a result of being overweight that leads to an excessive layer of fat under the chin. Growing older also makes your skin sag, as the muscles lose their elasticity and droop due to gravity. Losing weight is the only way to get rid of it. Start exercising daily to start shedding fat. Cut down on sugar and processed foods. Eat more fruits, vegetables, whole-grain foods and lean proteins like chicken and fish. Plus, certain exercises can help tone up your facial muscles to make your jawline more defined. Massaging your chin with nourishing and skin-tightening oils might also help. If you wish to reduce the fat under your chin and sport a naturally modelesque look in your selfies, here are five methods that can help you to get rid of a double chin. Here are some exercises you can try, along with following a weight loss diet and cardio workouts to lose weight. You will have to be persistent, as it can take 1 to 2 months of exercising daily to get positive results. Sit or stand with your spine erect. Tilt your head upward with your chin facing the ceiling. Push your chin forward and pucker up your lips so that you feel a stretch in your jaw and neck. Hold this position for at least 10 seconds, then relax. Do 20 reps per session, 3 or 4 times a day. Open your mouth as wide as you can and stick your tongue out. Roll it down to touch your chin. Repeat 10 times per session, 3 or 4 times a day. Turn your head to one side with your chin touching your shoulder. Count to 5. Slowly roll your head downward and keep your chin in the center of your chest. Hold and count again to 5. Next, turn your head to the other side and touch your shoulder with your chin to the count of 5. Gently roll your head backward until you chin is facing the ceiling. Hold the position again to the count of 5. Bring your head back to the resting position. Do this 10 to 15 times throughout the day. Make sure that you perform this exercise slowly or you can end up twisting your neck muscle. 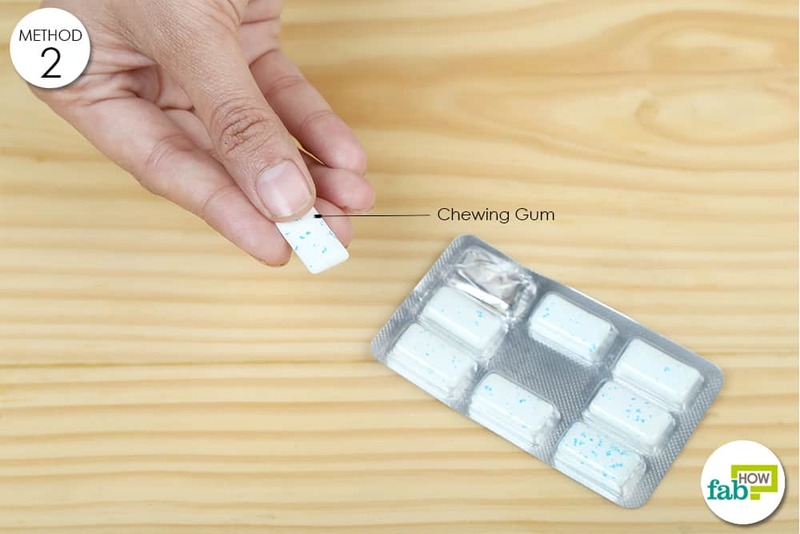 Since chewing gum involves facial muscles, it is an easy way to perform jaw-toning exercises on the go. (2) You can work your facial muscles even while you’re at work, without anyone noticing. However, make sure that you use sugar-free gum, as you do not want to add extra calories. When starting, do not go beyond 1 to 2 hours of chewing the gum continuously, as it can hurt your facial muscles. As you get comfortable, increase the duration. If you experience any stomach discomfort, stop chewing gum or switch to a different brand of gum. Continue doing so for at least 1 to 2 months to get positive results. Improving your skin texture can help restore its elasticity and also help shrink your double chin. Cocoa butter, rich in fatty acids, helps deeply moisturize your skin to make it supple. (3) Massaging the area in upward strokes helps improve the elasticity. 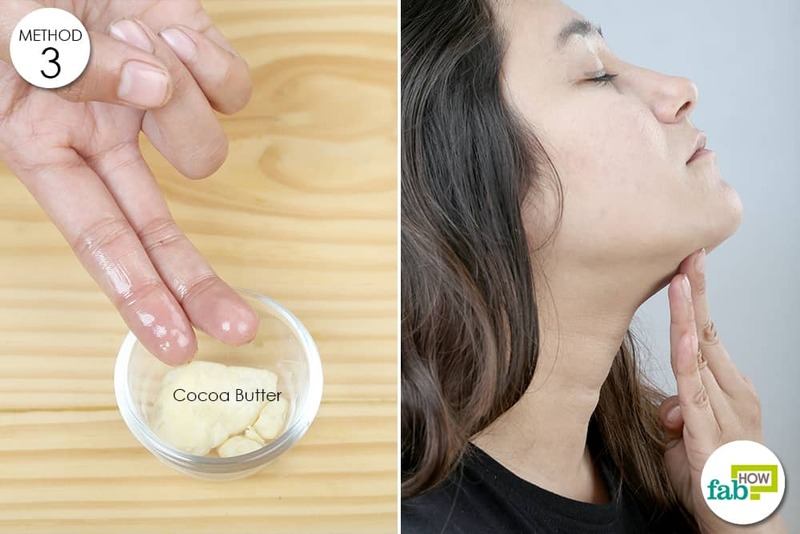 At bedtime, take some cocoa butter on your fingers. You can also warm it up a bit in the microwave. Massage it over your neck and chin using upward motions. Continue massaging for 5 to 10 minutes until the butter absorbs completely into your skin. Do not wipe or rinse it off. Do this every night for a couple of months. Another ingredient that can help tighten up your chin is wheat germ oil. Rich in vitamin E, the oil helps to nourish the skin and improve its elasticity with regular use. All you need to do is rub in some wheat germ oil on your chin at bedtime and let it work its magic overnight. 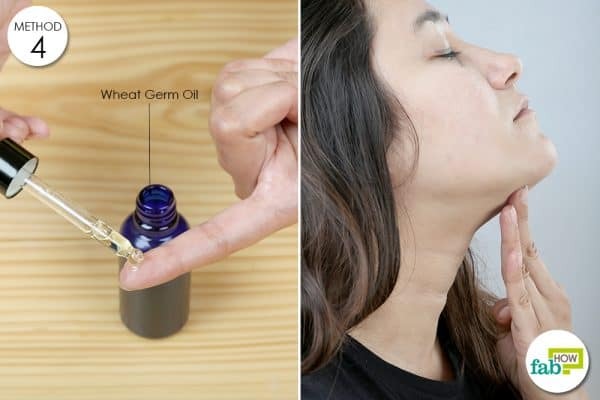 Put 2 or 3 drops of wheat germ oil on your fingers. Massage it into your neck and chin in upward strokes for 10 to 15 minutes. 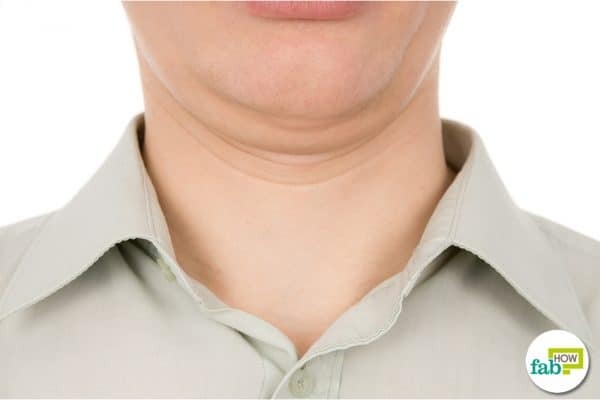 Do this every night for 1 to 2 months along with regular exercising to notice a remarkable reduction in your double chin. Egg whites are packed with nutrients rich in antimicrobial and antioxidant properties that could reverse the effects of skin aging. (4) Upward strokes with egg whites can help restore the collagen in your skin, the lack of which may lead to loss of elasticity. Egg whites also help shrink your pores and tighten the skin to give you an instant facelift. Egg whites can also be used in the form of a face mask to get rid of a double chin. 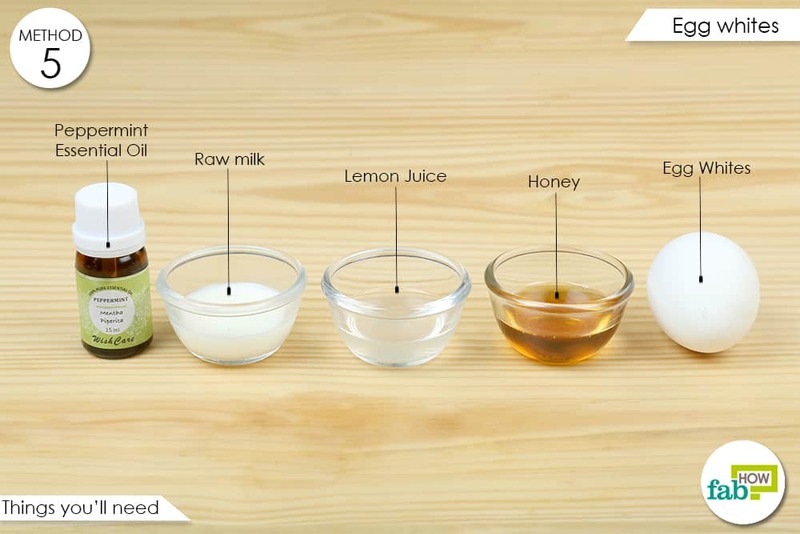 This face mask also uses honey, raw milk and lemon juice that cleanse and improve skin tone and texture. 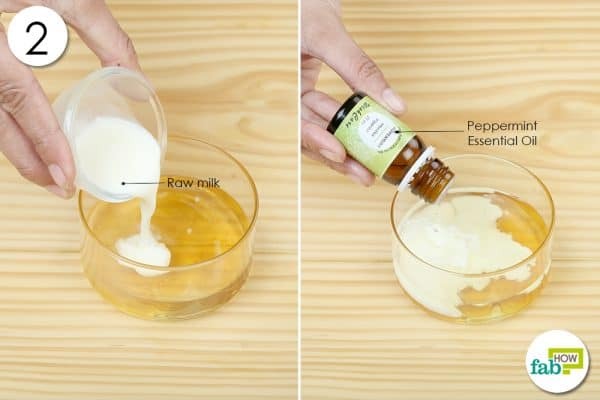 You can optionally add some peppermint essential oil to mask the egg smell. 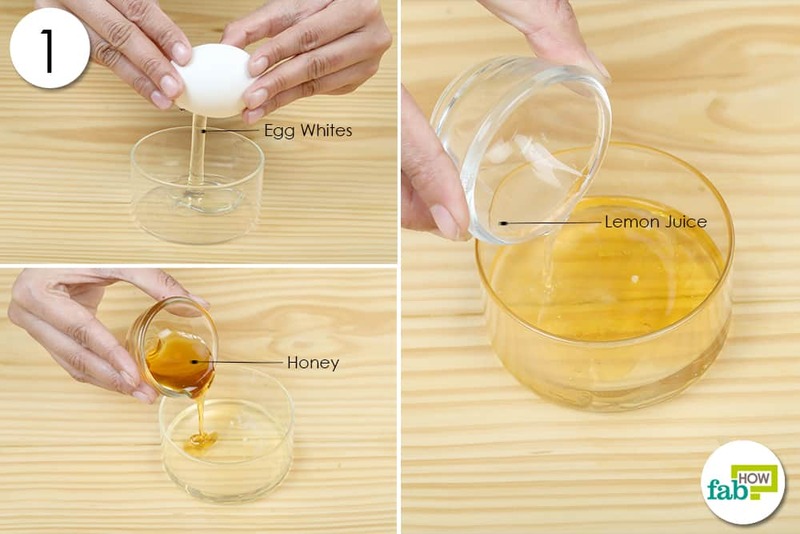 Break open an egg and collect only the egg whites in a container. 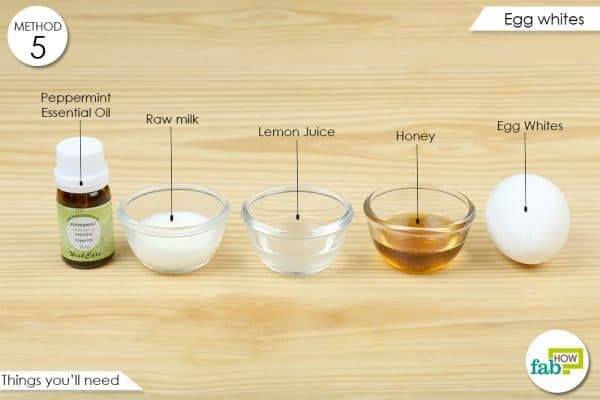 You can use the egg yolk to make a hair mask. Add a ½ tablespoon each of honey and fresh lemon juice. Add ½ tablespoon of raw milk. It helps slough away dead skin and impurities. Optionally, add 1 or 2 drops of peppermint essential oil. Use a whisker to blend the ingredients thoroughly. Use an applicator brush to apply the blend on your neck and chin region. Apply it using strokes upward. Let the mask dry up completely. 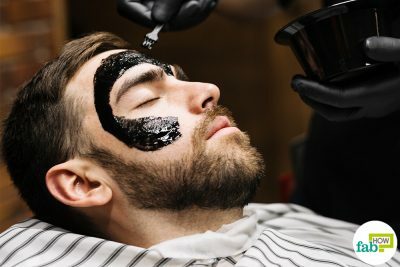 You will feel your skin tightening up as the mask dries. Apply a light moisturizer or rub in some wheat germ oil or cocoa butter. Apply this mask once every 10 days for 3 to 4 months to get rid of a double chin. You can also use glycerin to massage your neck and chin at bedtime. 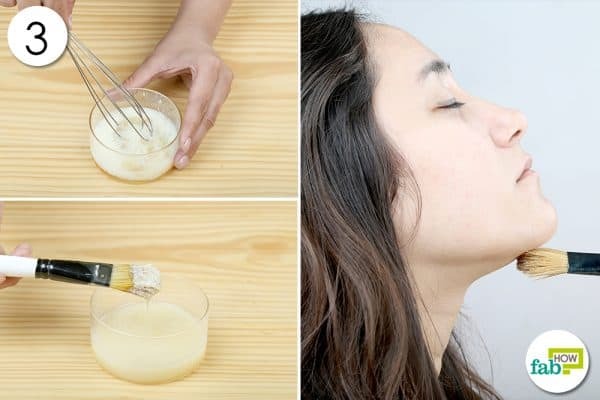 Applying the melon juice on your neck and chin can also help get rid of a double chin. Leave the juice on for 15 to 20 minutes, then rinse it off with lukewarm water. Try improving your posture, especially while working on a computer or checking your phone. You can also perform the Lion yoga pose to tone your facial muscles. Drink 3 to 4 cups of green tea every day to aid your weight loss. Altering your hairstyle can help hide your double chin while you try to reduce it with the home remedies and weight loss plan. Kini, Shetty. Associate Professor, Department of Prosthodontics, Dr. D.Y.Patil Dental College and Hospital, Nerul, Navi-Mumbai, Maharastra, India. Journal of Clinical and Diagnostic Research. http://europepmc.org/abstract/med/25302289. Published August 20, 2014. Takahashi M, Satoh Y. Effects of gum chewing training on oral function in normal adults: Part 1 investigation of perioral muscle pressure. Journal of Dental Sciences. https://www.sciencedirect.com/science/article/pii/S1991790218303222. Published November 26, 2018. Scapagnini G, Davinelli S, Renzo LD, et al. Cocoa Bioactive Compounds: Significance and Potential for the Maintenance of Skin Health. Nutrients. http://www.mdpi.com/2072-6643/6/8/3202. Published 2014. Miranda JM, Anton X, Redondo-Valbuena C, et al. Egg and Egg-Derived Foods: Effects on Human Health and Use as Functional Foods. Nutrients. https://www.mdpi.com/2072-6643/7/1/706. Published 2015.